“The leaves pounded into small pieces and applied with salt they break carbuncles [infected boils] [malignant skin tumours] all around. They stop hair from falling out of the head…. Chewed and the juice swallowed down they restore the loss of the voice.”. – Kale is rich in vitamin K and this prevents inflammation, assists with reducing joint pains and aids in building healthy bones. – It is high in fibre which helps to lower the amount of cholesterol in our bodies and to lower our overall risk of heart disease. – Kale is a great source of Vitamin C and aids in the prevention of cancer. -Make a simple salad with a bunch of thinly sliced kale, grated carrot, sesame seeds, raisins, and your favorite salad dressing. -Toss whole-grain pasta with chopped kale, sunflower seeds, pumpkin seeds, feta cheese, cracked pepper and a little olive oil. This is what I enjoy snacking on. Drizzle enough olive oil to coat the kale. Season with hot paprika, salt and cracked pepper and mix thoroughly with your hands to coat the kale. Place kale on a tray lined with baking paper. Place in the oven on 180C and bake from 10-15 minutes. Half way through turn the kale over to the other side. 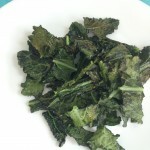 The kale chips are ready when the kale is crispy. Serve whilst still hot. It can also be cooled down and stored in a dry airtight container.